People Matters TechHR Startup Program 2018 aimed at identifying and recognizing HR technology startups in India and providing them with a platform to broaden their reach. 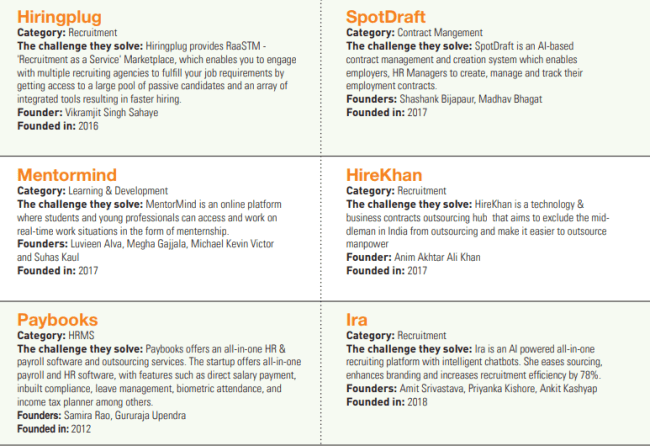 In the past five to eight years, hundreds of HR tech startups have emerged to provide solutions to the growing needs of India’s large and mid-sized corporations. Today, India is home to over 600 HR tech startups, some of them being VC & PE funded, and is also a haven for HR tech innovation. While the prospects of HR technology buying are increasing in India, there is enough space for multiple HR service providers to service the market, especially in mid and growth companies segment. For the last five years, the People Matters TechHR Startup Program has been bringing together early-stage startups in the HR technology space to interact with investors and buyers while giving them the opportunities to showcase their products to the decision-makers in the HR domain. The program aims to bridge the gap between evolving new age technologies and the HR practitioners. The 5th edition of TechHR, hosted at The Leela Ambience, Gurgaon saw a gathering of 3000+ HR Heads, CHROs, business leaders, investors and mentors with 28 HR Tech startups showcasing their products to this august gathering. 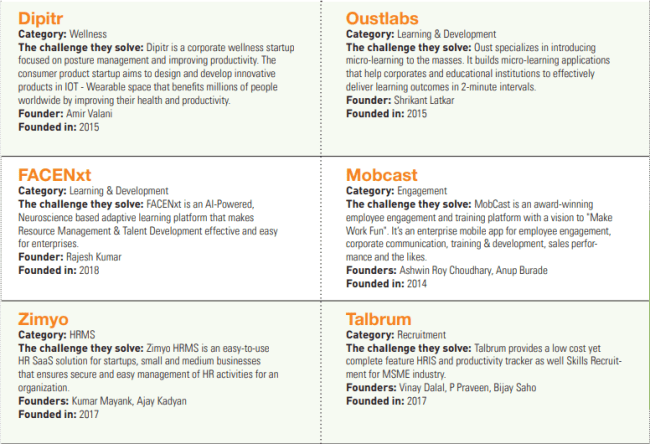 Evolving from a competition format to a full-fledged mentoring program that involved mentorship from investors over the course of three days, the program aimed at identifying and recognizing HR technology startups in India and providing them with a platform that enabled them to get wider recognition, and for them to survive and succeed. As per estimates, the market for HR technology solutions is reportedly around $400 billion globally and the investor interest in this sector is steadily growing. In the year 2017 alone, it is estimated that $2 billion were invested in HR technology companies globally. One of the biggest deals in the space in the first half of 2018 was the acquisition of the US-based, job review and job hunting website Glassdoor by Japanese human-resources and consumer-information provider, Recruit Holdings Co. for $1.2 billion in an all-cash deal. Another big announcement was that of Degreed, global platform for discovery, learning & certification of skills, raising a round of funding of $42 million, co-led by Owl Ventures and Jump Capital. Coming to India, the HR tech industry in India is now worth $1 billion and the space will further grow with investments this year. All these developments point out to the fact that the industry is headed for exciting times ahead. A bevy of 28 startups, solving problems ranging from recruitment to engagement to learning to compensation showcased their technologies to the community during the TechHR’18 event. The startup pitches focused on how on how their product was attacking the problem they had chosen to address, and how they benefitted the HR community. 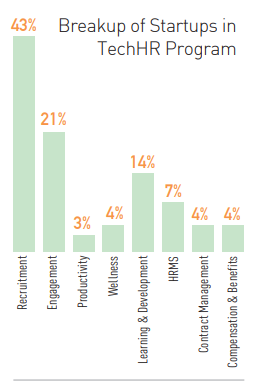 This year as well, like last year, more than 50 percent companies that participated were in the recruitment and engagement categories. Many of the startups also catered to addressing the problems in the Learning & Development space and Wellness through technology. Overall, startups are increasingly relying on new age technologies like Artificial Intelligence, Machine Learning, Chatbots to attack specific problems in the HR domain. Most startups also seemed to focus on the user experience and many products showcased were around creating a mobile-first environment. The motivation for startups to participate in the TechHR’18 stemmed from the fact that it provided a golden opportunity for the, to get exposure to HR decision makers, investors, HR tech entrepreneurs, and mentors. The program also provided a channel of direct feedback about products showcased during the event as well as generate leads. 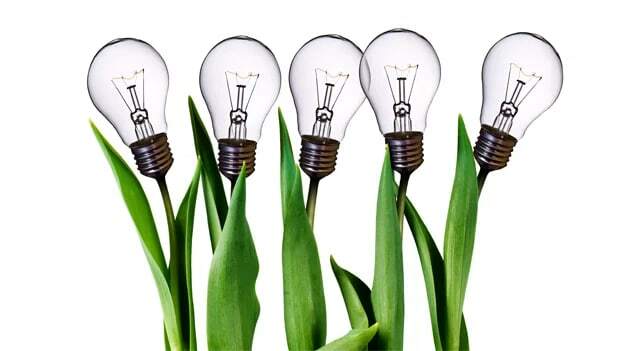 In the next 12 months, the startup will focus on bringing over the concept to India. It involves empowering individuals by promoting financial well-being and financial inclusion through salary benefits. As financial stress affects 1 in 4 employees in India, understanding and supporting teams for the HR is a key element for better employee retention and engagement at the workplace. Financial health of employees cannot be neglected any more in such a highly competitive talent market, which is what SalaryFits aims to propagate. For Verimployee, which aims to resolve the trust-deficit in the recruiting process, participating in TechHR gave them an opportunity to get feedback from the HR fraternity and industry experts as the product is going live in September. In the next 12 months, the startup aims to solve the trust deficit in the society and raise awareness amongst the corporates about its mission. Meanwhile for early talent discovery platform Vyre, participation in the program was a fantastic opportunity to connect directly with industry leaders and influencers and talk about how Vyre’s innovative technology can help change the way they hire. The startup’s work is cut out over the next 12 months. It will be following up on each and every one of the conversations it had at TechHR to ensure more companies can benefit from using its video-based talent discovery platform. In addition, it will target partnerships and continue to work on its product roadmap to ensure that Vyre serves the needs of the talent acquisition community as well as the candidates. The mentors for the startup program included investors such as Arpit Agarwal, Principal Partner, Blume Ventures and mentors such as Sairee Chahal, Founder & CEO, Sheroes; Tejasvi Mohanram, Fintech Entrepreneur & Investor; DN Prasad, Leadership Coach & PeopleCulture Strategist; and George Oommen, Director - HR, Technology & Process Consulting, Cognizant among others. As far as how he sees the HR tech space evolving in the coming years and the opportunities and challenges in this space, Rajul shared that employee productivity is the key theme for HR. Businesses are increasingly under pressure and HR needs to do everything a little better i.e. hire faster, better and cheaper, train people relentlessly, engage employees and drive productivity like never before. Combine it with some macro phenomena like gig, and HR should have their hands full. With 28 startups exhibiting for three days at the very entrance of the TechHR 2018 conference, the HR industry got a great flavor of what’s brewing in the HR tech ecosystem of the world’s third biggest startup nation. As India marches towards its goal of 10,000 startups by 2023, it will be interesting to see how far the share of HR tech startups grows in the coming years. With funding pouring in regularly in this space and investors not shying away from investing in HR tech startups, the overall air is of excitement and possibility in this space. What will make it more vibrant is the evolution of a home grown unicorn in this space which grows global, something which has still eluded the HR tech space in India till now.